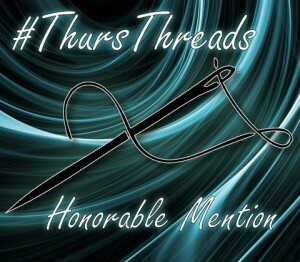 I can’t believe I managed to snag another honorable mention for Siobhan Muir’s #ThursThreads! Thank you to George Varhalmi for giving his time as a judge and to Siobhan for dutifully hosting this event every week. “Where do you think you’re going! ?” Her voice boomed like a thunder clap. I glanced up from my suitcase as she hurried into my room. The rage no longer fazed me. I knew it came from somewhere deep and ugly and sad. She lashes out because she’s scared. I used to be afraid of her, but now I just feel sorry for her. “I’m moving out, Mom.” I continued to pack my clothes, ignoring the tension in her angry stance. Her wild eyes narrowed and she crossed her arms over her chest. “How dare you tarnish our family name by living in sin.” She looked me up and down with such hatred, I thought she might spit at me. “Because we’re not married? Or because we’re gay?” I asked, sarcastically, and moved over to the closet. “You’re not gay,” she growled. Check out all the great stories from the week here.